As more and more brands come out with K-cups for Keurig coffee makers, there has been a huge increase in the quality of the coffee pods. That means that I actually look forward to trying new brands these days, where once I just hoped to get something that was tolerable (as opposed to good). 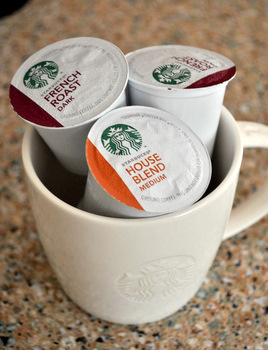 A new entry into the K-cup market is Starbucks and they have put several of their most popular blends – House, French Roast, Breakfast Blend, Pike Place, Cafe Verona and Sumatra – into these single-serve sizes to appeal to K-Cup users. I was hoping that they would do as good a job getting the flavors of their coffee into the K Cups as they had done with Via and I was pretty pleased with the results after trying both the House Blend and the French Roast. The French Roast is dark and smokey, with an almost minerally note to it. It actually tastes more like the espresso roast to me, when compared to regular Starbucks brewed beans, which isn’t necessarily a bad thing. The darkness of the roast is definitely the best thing about the French Roast because so many k-cup brands (although they call their products “extra dark”) just don’t make their coffee strong enough. I end up stepping down the size of my brew to get a more flavorful cup of coffee (or just one that doesn’t taste watery) and you definitely don’t have to do that with the French Roast. If you like your coffee with cream and sugar, it will hold up to that well, too. The House Blend was bright and smooth, with a little less character than the French Roast, but very well balanced. This one worked well at both my large and medium Keurig settings and stayed consistently good. Again, when I compared it to similar “medium” roasts from other brands, this one was fuller flavored and tasted a lot fresher than some of my comparisons (Caribou Coffee, for instance). The downside here is that the Starbucks K Cups are more expensive than some other K cup brands and – of course – are more expensive than getting whole bean or ground coffee. The upside is that you get convenience for that price and get the same flavor as you do from the ground coffee that you can also buy at the market. And that means that these will go on my list of K-cups that I’d buy again.